Two confessions: firstly, I am no big fan of Zack Snyder, director previously of Dawn of the Dead (2004) and 300 (2006), both of which while entertaining and exhibiting no little visual flair were let down by rather flabby storylines and frankly embarrasing characterization. Call me old fashioned for asking for a little of these. Secondly, I must also make clear that I have never read Watchmen, Alan Moore’s legendary (to put it mildly) comic book series which serves as this film’s considerable basis, so am in no position to discuss whether it adheres faithfully to the original source material or not. 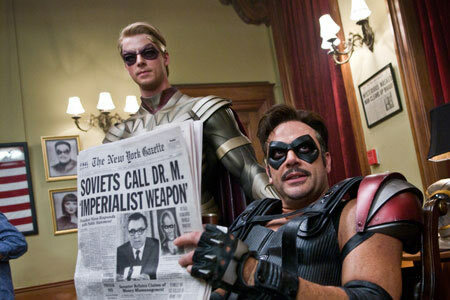 All I will try to do, then, is assess whether or not Watchmen works as a film. The answer is: well, sort of. As a piece of entertainment, it is certainly riveting enough to keep an audience’s attention, even for its absurdly long 162 minute running time, a duration even some ten minutes longer than last year’s slog of a superhero epic The Dark Knight (2008). In comparison with a lot of other films adapted from comic books, it is undeniably superior: obviously better than things like Fantastic Four (2005) or The League of Extraordinary Gentlemen (2003), but I would significantly add that I found it more enjoyable than V for Vendetta (2005) which I found both tedious and shallow. Where I find fault, however, is my general beef with the director: he is perfectly able to enthrall on a visceral level, but not on an emotional or intellectual plane. This may have been okay with a glossy zombie film or a blatantly historically inaccurate swords and sandals gore-fest, but Watchmen is something different. Firstly, I would congratulate Snyder on making what is clearly a complex, multi-layered source into a coherent, fully realised world and also in being able to squeeze out of it something of a semi-coherent narrative from it. Time will jump around considerably during the course of proceeedings, but for simplicity our ‘present’ timeframe is an alternate 1985, a world where Richard Nixon has been re-elected for another term after winning the war in Vietnam, largely thanks to the presence of a group of masked superheroes. A montage at the beginning of the film elegantly illustrates the effect that the presence of these anonymous characters has had on shaping this off-kilter version of reality: the Kennedy assassination, the moon landings, the fall of counterculture all were somehow touched by them. Now the world stands on the brink of nuclear annihilation following a standoff between the USA and the USSR in spite of, or perhaps because of, the presence of the nuclear-powered superhuman Doctor Manhattan. For several years now the other superheroes have found themselves outlawed and have either found themselves in retirement or acting as above-the-law vigilantes. The murder of one of their clan, The Comedian, leads another, the masked Rorschach, to seek out the others warning that someone is trying to kill them off, possibly in relation to the upcoming potential war. This much is clearly portrayed. The problems only start arising when, once again, we turn to Snyder’s handling of themes and subtexts. There are long passages of the film where the script verbosely tries to tackle what are obviously complex subjects from the Moore original: ideas about human nature, spirituality in the face of a seemingly omnipotent being, alienation and identity concealment, even the vary nature of time and the way humans perceive it. The trouble is, I get the impression that the director doesn’t know what to do with these ideas, instead loading the film with expositionary dialogue and flashy graphics and hoping this will be enough for the audience. I have to say I left the auditorium unsatisfied, wanting a lot more. I suspect I will have to read Alan Moore’s original to get this. The long wait for Watchmen to arrive on screen appears largely to have achieved the impossible task of satisfying its legions of fans in terms of bringing to life the style and to an extent the content of the comic book series. There will always be nit-pickers at the periphery complaining about missing scenes, references or minor characters, an argument that I neither can nor want to wade into. All I can say is that were it not for the weight of expectation and the obviously grand ambition and scope of the project, this would be a worthy, enjoyable action romp. But as is obvious from the ringing out of “The Times They Are a Changin'” over the opening credit sequence, in terms of its supposed social commentary this is ultimately a film which has set its aim way too high for its own good.